AZ-Birding compiles the most exciting recent sightings in the state, cutting through the thicket of news, rumors, and reports for you. Check in often to find out what we’re seeing—and what we can show you on your next trip to Arizona. Rufous-winged Sparrow 21 Apr Santa Cruz River--Cortaro Rd. Explore more Arizona birding data at eBird. 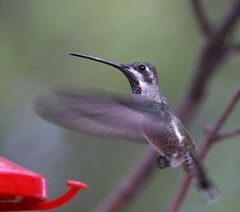 Thank you to Chris West for this fine photograph of the Plain-capped Starthroat at the Spirit Tree Inn in Patagonia.